One of the things that upsets me most about my trip to India is that it’s lead me to hate monkeys. I used to love them so much. Before they started trying to steal my stuff and attack me. The locks on my zippers have so far protected my belongings not from people but from monkeys. They wouldn’t be so bad if they didn’t always travel in gangs. You’d better hope there’s someone else to help fight them off once there’s four or five of them hissing at you at once from all sides in the middle of a suspension bridge. 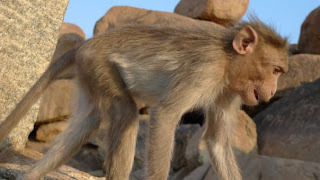 If you ever find yourself being cornered or stolen from, make sure to bend over and pretend to pick up a rock to throw as quickly as possible if you don’t want to fall victim to a gang of our primate brothers.